One of things we really like about the building is it’s an open warehouse with loading docks on both ends. It’s a perfect blank slate to layout a breweries flow; ingredients are received in one end and bottles and kegs out the other. The only catch was we couldn’t decide where to place the brewhouse. Every equipment supplier that visited the building suggested we either build out the front or cut huge windows in the side so you could see it as you pulled up to the building – A very cool and traditional way of showing your goods..But we didn’t think it made sense to add more space to an already huge building…so we scratched it and continued sketching ideas. The brewhouse platform will sit 12’ high so the second idea was to cut viewing windows from the outside of the building and design a platform that you could access from the 2nd floor mezzanine/banquet room extending the whole way around the brewery above fermentation and bottling. The platform would become a tour path overlooking our whole process…pretty neat idea until we received the $500,000 price tag. So we killed that option and flip flopped a couple more times from the east to west end of the building trying to make it visible from the parking lot. 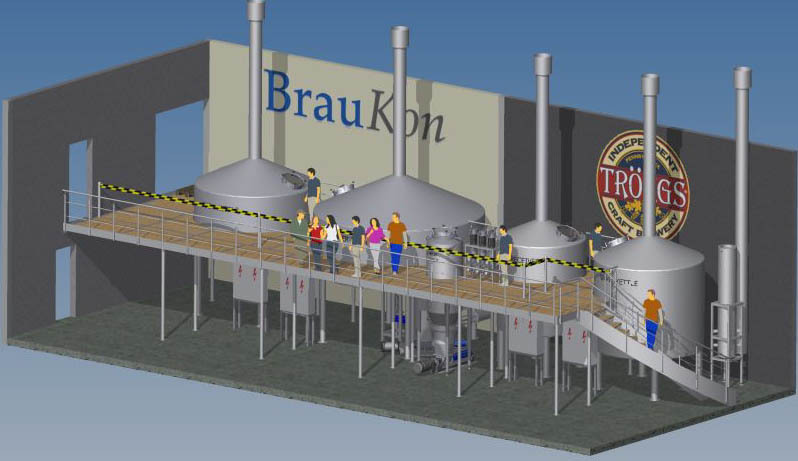 Then Markus (Braukon) suggested we place the brewhouse right in the middle of the tasting room totally exposed with only a railing and 75’ foot bar as the separation – if you’re ever in Pittsburgh check out the Hofbräuhaus, similar concept Braukon built on a smaller scale. 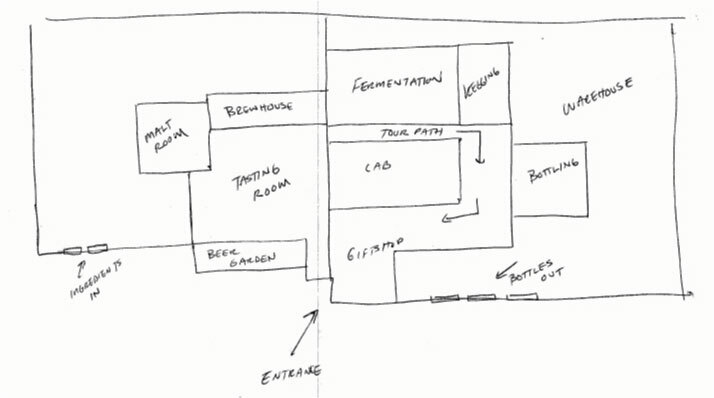 Our tasting room sits slightly off centered towards the east side of the building where all the main utilities (water,gas, electric) already come in into the building with a set of loading docks close making it easy to receive ingredients. From a process point it makes sense so we stuck with it and it’s going to be one incredible visual and sensory load for everyone in the tasting room. Braukon engineered each tank to share the space with our customers with special insulation for noise, heat and ton of safety shut offs. The bar will run parallel with the brewhouse for 55’ with the smaller pilot brewhouse right beside it. Total length is almost 75’ of stainless steel! So when you’re sampling beer you’ll hear our pumps, smell the sweet wort and watch a brewer load 150 lbs of fresh whole flower hops in the hopback. Pretty freak’in cool…..